So LEGO Simpsons. An oddball theme that came out of left field. This theme had 2 sets, 3 Dimentions sets, and 2 CFM series. Man, what is it with this theme and the number 2? So, there is a rumor out there, I found out about it through BrickVault, that Simpsons may be returning this year. I don't think it's all that possible, but I do hope it comes true. So below are sets that LEGO should make in The Simpsons. Retailing for $100 USD, this set would be a detailed Springfield Police Station and come with Lou, Eddie, Cheif Wiggum, Snake, and Lionel Hutz. This is a pretty self explainatory set, but this would be pretty cool. 3: Springfield Elementery. This would be the next Simspsons House. Retailing for $200, this would be a 2 floor and basement set, and this would have 2,500 pieces. It would look like how it looks like in the show, and would have 10 rooms. The figures would be Bart, Lisa, Milhouse, Skinner, Superintendent Chalmers, Ralph, Ms. Krapapple, Nelson, Martian, and 5 student characters. 2: The Blocko Store. Man, would this be a set! Retailing for $50, this would be the Blocko store from episode 497 "The D'oh-cial Network". This set would have Lisa, Homer, Bart, Marge, a store clerk, and Maggie. 1: Blockoland. From episode 263 "Hungry Hungry Homer", this set would be $200, and have 3 Blockland clerks, a ticket taker, the Simpsons family, the Flanders family, and 3 ride operators. The parts of the set will be just like in the episode. They've already done Wiggum, Snake and the police car so this would be covering old ground again. I cannot see the theme happening again somehow. Your pricing seems way off too. $200 for a 2500 piece set, with 14 minifigures (school) and 15+ minifigures (Blockoland), depending on what you include in the families. Seems very low compared to other licensed sets. forgot about Krusty! Which is weird because I have that set. Now, not to put you on the spot, but is it because you have a source? Or did LEGO say it wasn't returning? Since Disney is in the process of acquiring 21st Century Fox, we should probably wait till after 2019 for more LEGO The Simpsons sets. That’s when the merger will be complete. 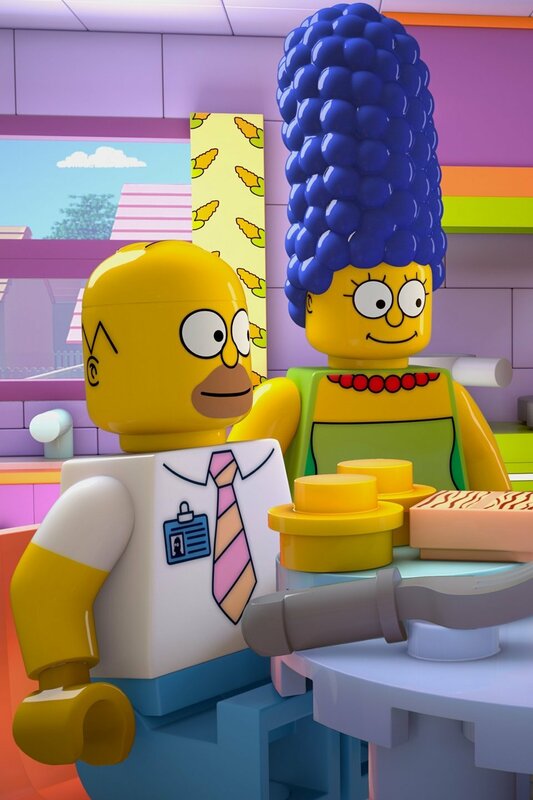 So, does LEGO still have the license for The Simpsons, or has it expired? I hope that, if Disney successfully manages to acquire 21st Century Fox, LEGO could make more The Simpsons sets, such as BrickHeadz or even a Mr. Plow set with a new wintertime Homer minifigure! but I also think that the simpsons are not coming back. I don't think there is much hope for it now. It is a shame they missed some important characters for whatever reasons - Moe, Barney, Lenny and Carl, Skinner, Otto - when giving us other lesser ones. I cannot understand why they did Edna Krabappel but not Skinner. Let's wait and see if, and only if, Disney manages to acquire 21st Century Fox and its entertainment assets. Disney and LEGO once again have a wonderful relationship, so only time and money will tell. Extremely unlikely given the high cost of making individual moulded heads. That Lego actually produced a second CMF series was a surprise, and let's be honest it didn't sell very well. Sorry but I think the theme is done, over etc. If the acquisition does go ahead, I imagine Disney will have a lot more to push than The Simpsons. Disagree with your #2 and #1 options mainly because i dont view them as "iconic" Simpsons landmarks. Moes Tavern would be great but I don't think Lego would do a bar given its family friendly outlook. A billion times yes, in fact any Futurama sets. Sadly, the licence is with MegaConstrux and I recently saw Brickheadz-type efforts (ugh) in a discount bin. Bender looked half decent (on the side of the box, they didn't have him) but Fry was awful. Extremely unlikely given the high cost of making individual moulded heads. I never understood why Lego did this, when the Lego episode of The Simpsons featured normal minifig heads, just with new hair pieces. If this theme does ever return (after either Disney or Comcast buy Fox, probably), it might be easier and cheaper for Lego to reboot the theme without the moulded heads. Plus, using normal minifig heads would make it easier to give the characters different expressions, rather than simply "eyes open" or "eyes partly open". Hopefully Mega Construx May lose the Futurama license in the future if the Disney-Fox merger is approved, but Futurama isn’t family-friendly due to PG-13 content. It's rated PG with a few episodes rated higher due to content. Exactly the same as the Simpsons. I think they look better as molded heads rather than regular. The noses and ears on regular heads don't look right to me, but look fine on the molded ones. If this theme does ever return (after either Disney or Comcast buy Fox, probably), it might be easier and cheaper for Lego to reboot the theme without the moulded heads. If they are going to go down the route of doing it as cheaply as possible, it is probably best they don't do it at all. It wouldn't fit in with previous Simpsons sets, so it would possibly alienate people that bought in first time around and they would still need to mold specific hair pieces anyway. Would like to see the elementary school and power station as they are landmarks in the Simpsons and AFAIK there are no schools or power stations in the city theme, so these sets could fill that hole. I know that "Blockoland" isn't THAT iconic, but I kinda think it would be easier for LEGO to do as it's essentially LEGOLAND, so it might be kinda easier to do than the Springfield Police station and other Simpsons landmarks. Who knows? Maybe they will eventually release a LEGOLAND set. I would give my right arm for LEGO Futurama minifigs. Or perhaps rather my left arm. With sculpted heads like the Simpsons. Yes please. S.up and take my money! !